Shrub or small tree, up to 10m tall, native to northern Australia and southern New Guinea, cultivated in Madagascar and Honduras. Main components of M.viridiflora essential oil from Madagascar were 1,8-cineole (70%), α-terpineol (8.3%), α-pinene (6.5%), β-pinene (1,9%), and p-cymene (1.1%) e.g. The niaouli oil-producing Melaleuca viridiflora grows in North and West Australia and is grown in plantations in New Guinea and Vietnam. Concerning the composition of niaouli oil and data presented thereof, delineation of M. viridiflora to M. quinquenervia is often not made and there are also several chemotypes. Niaouli oils traded often come from New Caledonia or Madagascar, and contain cineol in the range of 35-65%. 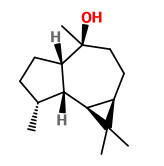 Other important components are the monoterpenes α-pinene, β-pinene, limonene, and α-terpineol as well as the sesquiterpene viridiflorol. There are also niaouli oils with low cineol content, but rich in nerolidol, linalool or viridiflorol. The hydrodistilled essential oil of the leaves and twig tips is traded as niaouli oil. 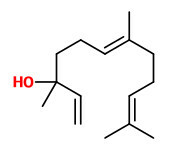 Main components are 1,8-cineole (43-70%), viridiflorol (2.9-12%), α-pinene (5.8-11%), α-terpineol (4.9-8.2%), limonene (4.4-7.6%), β-pinene (1,4-2.7%), and (E)-nerolidol (0.2-4,2%, which is not present in cajeput oil).